The Wharf/Ganplank Marina is accessible by Metro, car, bike, or taxi. Metro is usually the best way to get there. The Southwest Waterfront Metro Station is just two blocks away. Due to the ongoing construction in the area, parking is extremely limited. The use of public transportation is strongly suggested. Please click here for transportation and information for The Wharf. By Bike: You can bike to the Waterfront! Check out the map, or visit WABA's area bike maps. American Spirit is located at the dock entrance closest to 6th and Water Streets SW, Washington, DC 20024. 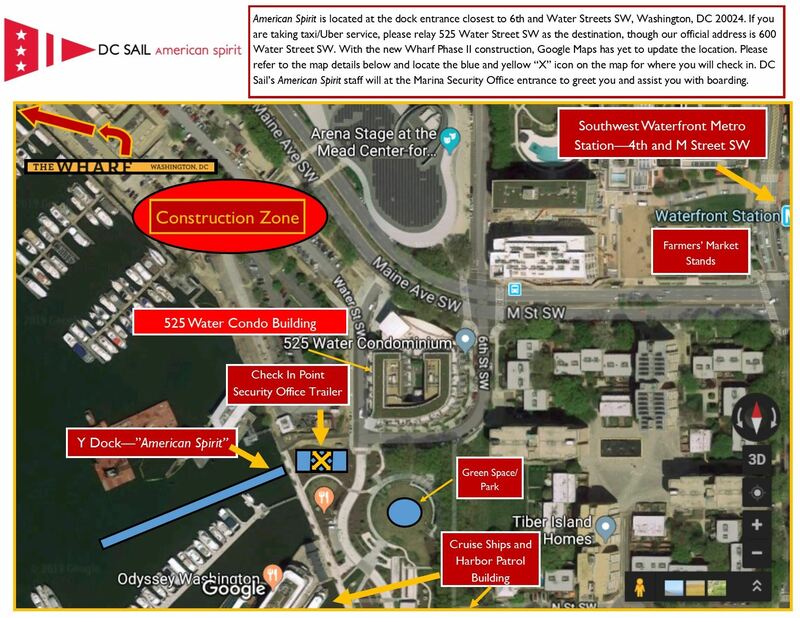 If you are taking taxi/Uber service, please relay 525 Water Street SW as the destination, though our official address is 600 Water Street SW. With the new Wharf Phase II construction, Google Maps has yet to update the location. Please refer to the map details below and locate the blue and yellow “X” icon on the map for where you will check in. DC Sail’s American Spirit staff will at the Marina Security Office entrance to greet you and assist you with boarding. Please click here to launch a .pdf of the map image posted below. Please click here to be delivered to a Google Map. Navy Yard/Ballpark is the closest Metro Station. We are located on the Anacostia River just behind Nationals' Park. There are limited metered parking spaces in the area. Please note: During the baseball season, when the Nationals or D.C. United are at home, parking is severely restricted and expensive! The use of public transportation is strongly suggested.